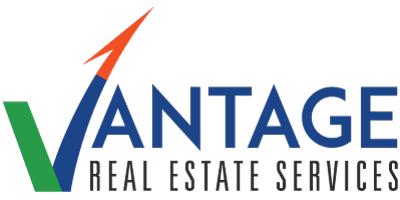 Housing investment has transformed in the years following the real estate market crash of 2008. 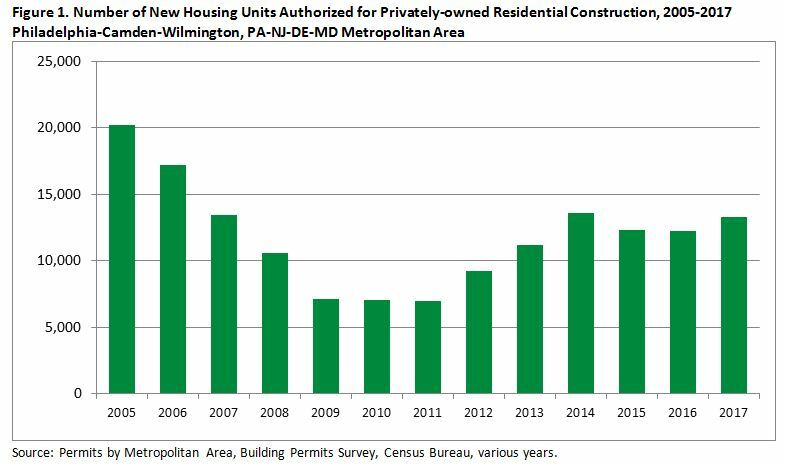 The number of privately constructed housing units has steadily climbed since then, increasingly so over the past six years. In 2009, a total of 582,000 building permits were authorized for privately-owned housing construction in the United States; the total bounced up to 1.2 million in 2017. The 11-county Greater Philadelphia region shows a similar trend (Figure 1). The number of units permitted dropped from 20,000 units to 7,000 from the peak to the trough. Since 2013, the number has climbed back to around the 13,000-level. The increase in the number of housing units authorized for buildings with 5 units or more is significant. In the mid-2000s, around 18 percent of units nationwide were in buildings with 5 units or more. By 2017, the percentage had increased to over one-third. 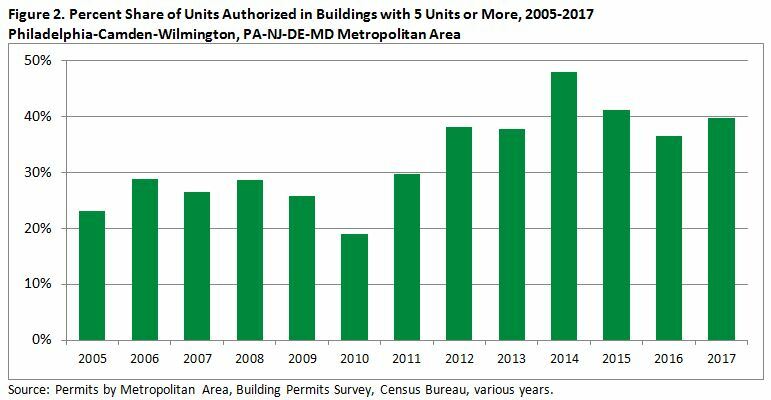 In the Philadelphia region between 2014 and 2017, the number of units permitted in buildings with 5 units or more averaged around 5,330 units. This is higher than the peak number of 4,900 units prior to the housing market collapse. In contrast, 8,030 permits were issued in 2017 for single family homes, twin homes, and buildings with fewer than 5 units, which is half of the 2005 level. Figure 2 shows the trend of permits issued for buildings with 5 units or more in the Greater Philadelphia region; now the share nears 40 percent, about 15 points above the level before the crash. Figure 3 shows a comparison of similar developments between Philadelphia and Montgomery County, PA. 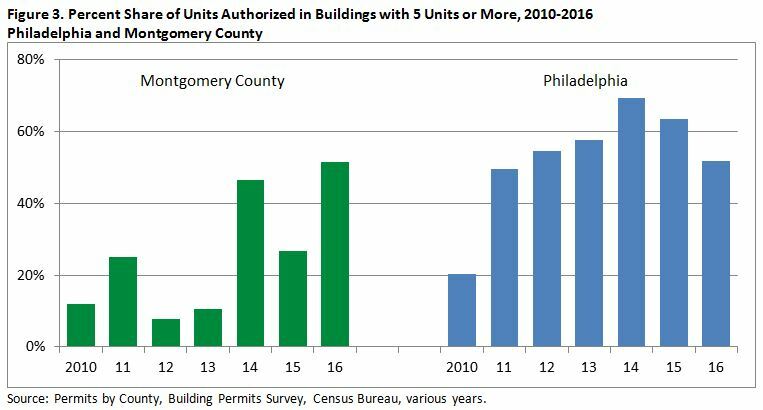 In Philadelphia, the share of units authorized in buildings with 5 units or more has sharply increased since 2010. The share in suburban Montgomery County varies greatly, except for the years 2014 and 2016 when it ranged around 50%. There are several possible explanations for this shift, including an increasing consumer preference for higher density living, the rising cost of construction of single family homes, mortgage lending difficulties, and the rising cost of land cost in Philadelphia and the close-in suburbs. The rise in permitting of multifamily housing is often a cause for concern within communities. Long-time residents may see new multistory buildings as a threat, as they change the skyline and the established visual experience of their community. They may associate such development with gridlock, school crowding, and even property value decline. On the other hand, proponents of Transit Oriented Development and New Urbanism contend that multifamily developments have insignificant impacts on roads and school. 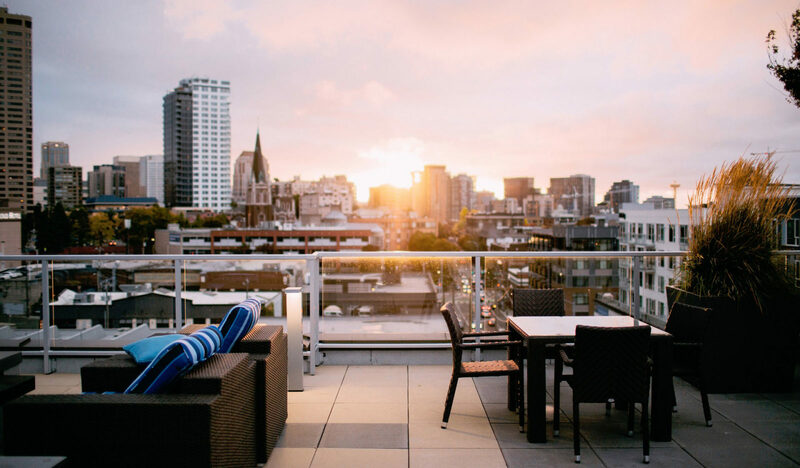 They suggest that young professionals and empty-nesters prefer living in higher density neighborhoods, and when housing is close to public transit, traffic and parking demand decreases. Until recently, impact assessments of residential projects relied on statewide demographic multipliers that are based on the 2000 Census records. Considering the demographic shifts and housing market changes that have occurred during the past 18 years, the methodology has to change in order to provide accurate estimates of generated impacts. The starting point is using up-to-date, locally relevant demographic multipliers. It is difficult to generalize the anecdotes on impact of individual projects because the results are inconsistent. Read the full article at ESI.